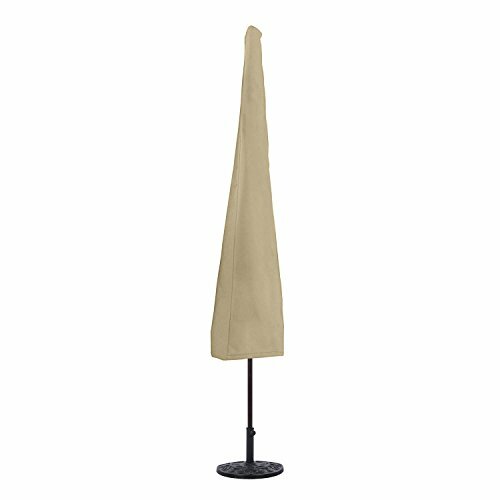 SunPatio outdoor living covers are designed to offer a high level of protection for your outdoor living furniture. Constructed with meticulous detail, these heavy duty water repellent Polyester outer shell and water-resistant vinyl undercoating brings you elegance, durability and long-term value in outdoor investments. ► Made of durable 600D Polyester vinyl undercoating with special water repellent processed, SunPatio outdoor living covers resist tearing, cold cracking and rain, much durable than other brands. ► Sturdy zipper with long reach drawstring for easy zipping and unzipping, convenience fiberglass rod for easily lifting umbrella cover on or off. Please make sure to check the size and shape of your umbrella to select proper cover size before purchasing.